These saddlebags offer a premium leather look with an extra-durable construction. Fits '00-'17 Softail® models (except FLS, FLSS, FLSTNSE, FXCW, FXCWC, FXS, FXSB, FXSBSE, FXSE, and FXSTD). Also fits '09 FXSTSSE models. FXSTC models require separate purchase of Hardware Kit P/N 90573-07. 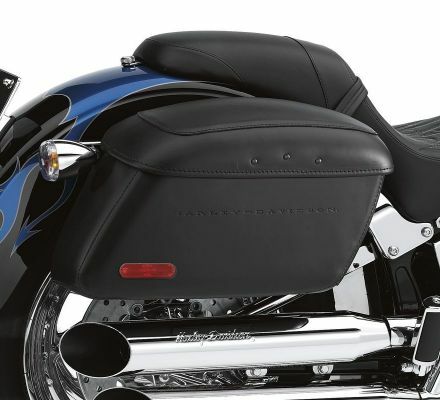 Fits '84-'99 Softail® models with separate purchase of Directional Relocation Kit P/N 53692-96. (FLST, FLSTC and FLSTS models do not require this Directional Relocation Kit). (Does not fit '84-'99 models equipped with H-D® Detachables™ accessories). Does not fit with Rear Axle Covers, Wide Tire Kit P/N 43684-99 or Flat Lens Turn Signal Kit P/N 68431-95. FLSTFBS models require the removal of Original Equipment Rear Axle Covers.